Self-publishing with Kazoo gives your book a fast route to market. You retain all your rights and get the highest possible payment (royalty) per book, as there are no publisher overheads. By choosing Kazoo you ensure that your book will be produced to the highest possible industry standards and that it will compete with books published by traditional publishers. It will be produced by experts with over 50 years’ industry experience. It takes approximately eight weeks from signature of the Author Agreement to the delivery of your books. This includes cover design, typesetting and proofreading. Additional print orders will usually take approximately two weeks from order to delivery. Please note that Kazoo use several third parties for printing, shipping etc. and delays incurred by these suppliers are out of our control. However, all our suppliers have been chosen for their professionalism and reliability, and delays are rare. You can pay by credit card, PayPal, euro cheque, bank transfer, banker’s draft or postal order. All cheques should be made payable to Kazoo Independent Publishing Services. We require payment on signature of the Author Agreement. Work will not commence until payment has cleared – we are happy to discuss payment plans. Why do I need to sign the Author Agreement? The Author Agreement explains exactly what our service entails, what we expect from you and what you can expect from us. You retain full rights to your book; we provide publishing services only. It is important that you are aware of deadlines in order that your books are delivered when you expect them to be, in accordance with our publishing schedule. We want you to be comfortable with what we offer and to understand your rights. Delivery costs vary depending on where you live in the world, and on the size of your book. We will quote your delivery costs as soon as we know them. How many books will arrive? You will receive a printed proof copy of your book to confirm everything is in place. When you have signed off on this, the printing process starts. Kazoo standard publishing packages are for a minimum of 100 paperback or 100 hardback copies. The majority of authors require additional copies and we will quote for these at the outset giving you a clear price with no hidden additional costs. If you have a successful launch, are supplying a local bookshop or a distributor, you may require more copies of your book than you expected. We are delighted to supply additional copies at any stage – although it is more cost effective to order a larger quantity at the outset. Costs vary depending on the size of your book. What size will my printed book be? Our standard trim size is known in the trade as a B format paperback, the same size as Fifty Shades of Grey or The Girl With The Dragon Tattoo (198 mm x 128 mm). We also offer picture books and hardbacks in a variety of dimensions – the size or extent of your book will effect the print cost, and we will discuss the options with you in detail. Why will it be that size? Our paperback size is a standard book-trade trim size that fits on all bookshop shelves; some booksellers do not stock books in larger formats. What kind of paper will it be printed on? We use 80 gsm cream bookwove paper, which is of a higher quality than that used in most B format paperbacks. Cream paper is optimal as it minimises glare. Our covers are 240 gsm cover board with a gloss laminate finish. We offer a choice of seven interior layout templates for you to choose from and can custom design an interior layout as required. Absolutely! If you would like a custom design, we’d be delighted to discuss your requirements. Each project is quoted separately according to your needs, and prices start from €300 in addition to your print package price. The ISBN (International Standard Book Number) is an identifying number that is assigned to each edition of a book. It is used by bookshops, libraries and online stockists to catalogue and identify your book. Your book will be assigned three ISBNs. Why do I need three ISBNs? One ISBN is issued for the printed book (this will appear on the back cover as a barcode), and each eBook format (see below) is issued with a separate ISBN, one for the mobi and one for the ePub edition. If you require a paperback and hardback edition of your book, each version will require a different ISBN. Kazoo supply all ISBNs as part of our package. What are mobi and ePub editions? Your book will be converted into an eBook as part of the standard package. There are two eBook formats – one for Amazon (mobi format) and one for all other eBook retailers (ePub). To enable your eBook to be uploaded to eBook retailers’ websites we will fill in a metadata form, which lists the title, subtitle (if applicable), author, prices, territories (as it’s your own book you will have world rights), blurb (short description of the book), BIC (subject/genre code for the British book trade) and BIASC (subject/genre code for the US book trade). A complete list of both BIC and BIASC categories is provided in the metadata form and a member of the Kazoo team will complete this form in consultation with you. What should the recommended retail price be for my eBook and my printed book? Pricing is completely up to you. We can give you guidance on industry norms and you should research the price of competing books in your category. Please note that Amazon applies sales tax to eBooks and this tax varies depending on where the purchaser lives in the world – your book will therefore appear to retail at different prices in different territories. How will I deal with eBook retailers? Amazon: as part of the Kazoo service an Amazon vendor’s account will be set up for you. Kazoo will upload your book to Amazon, and you will then be responsible for maintaining the account. You will be paid directly by Amazon. iBooks, OverDrive, (who are a wholesaler who make eBooks available to Tesco, Eason and WH Smith plus many other online retailers ) Barnes & Noble and all other eBook retailers will be serviced by Kazoo. You will be paid royalties quarterly by Kazoo for sales made through these retailers. You will receive 80% of the actual amount received by Kazoo from the retailer. How much can I expect to earn and when do I get paid? How much you earn depends entirely on your sales and on how well you promote your book. Amazon will pay any royalties due directly to you each month as per their terms and conditions. Kazoo will pay any royalties due quarterly. If you are due less than €20, the amount will be carried forward to the next quarter. How will I know how many books I have sold online? On Amazon, when you log into your separate Kindle and CreateSpace accounts, you have the option to view live sales reports. For all other eBook retailers, you will receive quarterly sales reports, which will list each retailer and which territory the book was sold in, along with quantity and price. How do I sell my printed book? Can Kazoo organise for my books to be delivered to bookshops? 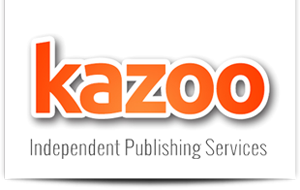 Kazoo is a publishing services provider only. We do not organise local distribution of print books. We ensure that your print book will be available for sale worldwide through Amazon and that your eBook is distributed through all major eBook sales channels. If you want your book to be stocked in bookshops in your home country, you need to approach distributors yourself. Kazoo deliver all orders to your address, we do not deliver to booksellers or wholesalers.